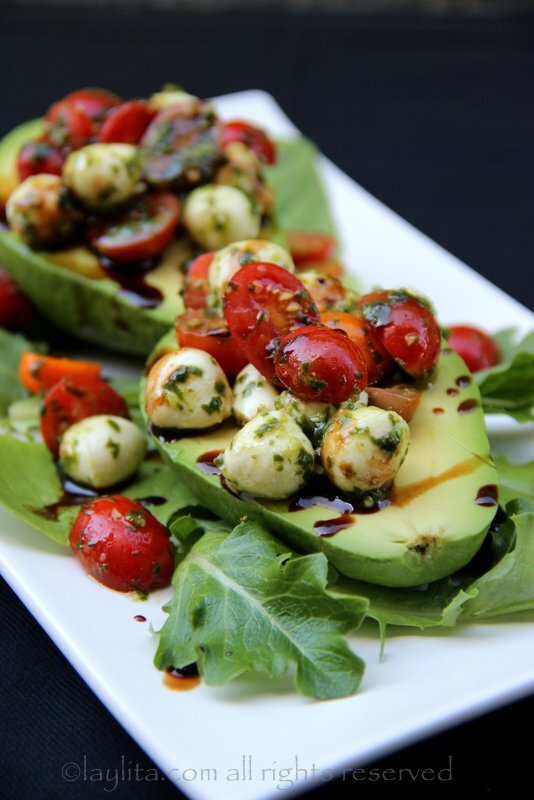 This caprese stuffed avocado recipe is a delicious appetizer or salad; it is made by filling ripe avocados with tomato and mozzarella caprese salad topped with balsamic vinegar reduction. Caprese salad is one of my favorite salads, and stuffed avocados is another one of my all-time favorites, so naturally it was just a question of time until I prepared an avocado stuffed with caprese salad. I wish I had done this years ago, it is so amazing! 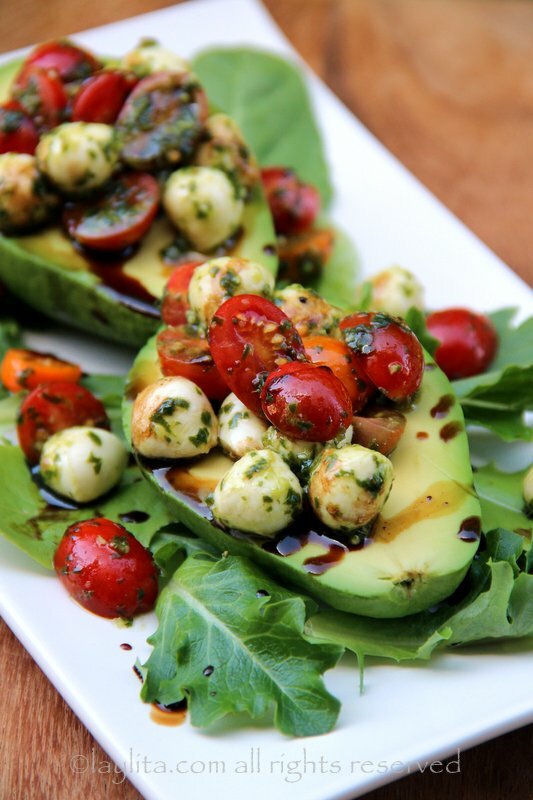 I already loved the combination of avocado with balsamic vinegar; add the tomatoes, fresh mozzarella and basil garlic oil, and it is heaven in your mouth. 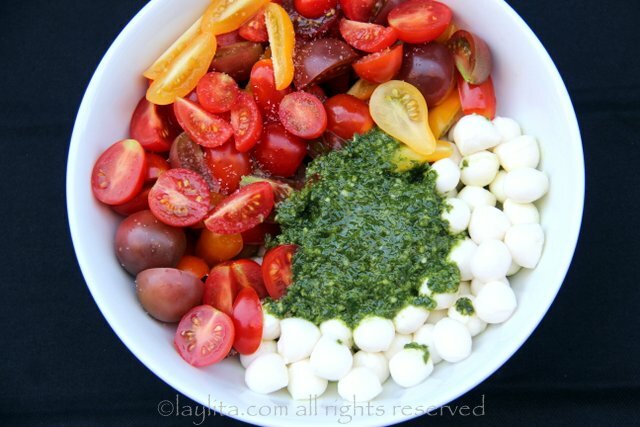 As you might have noticed, I am obsessed with tomato mozzarella caprese salads – the good thing is that my family loves it, and the guests I’ve tested this on also love it, so I will consider it a win-win for all. 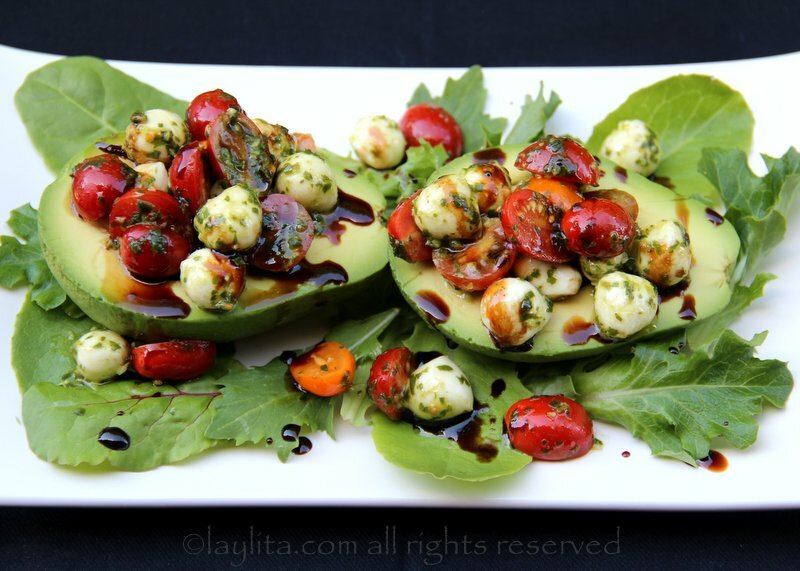 Recipe for caprese stuffed avocado, a delicious appetizer or salad made by filling ripe avocados with tomato and mozzarella caprese salad drizzled with balsamic vinegar reduction. 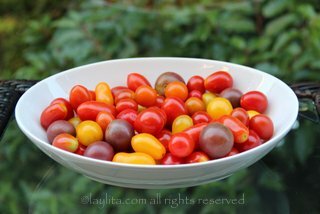 Place the tomatoes, mozzarella pearls or ciliegine in a bowl with the basil oil, mix well. Can be used immediately or refrigerated until ready to assemble the avocados. 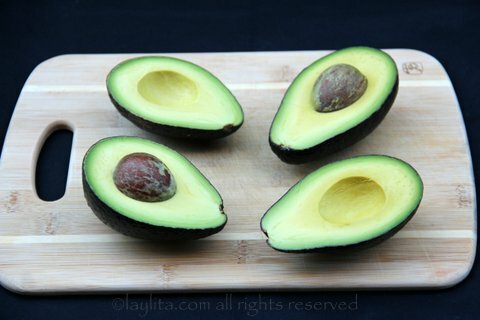 Cut the avocados in half lengthwise, remove pits and carefully peel the avocado halves. 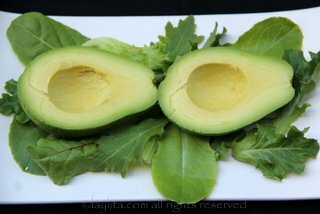 Place the peel avocado halves on a plate, can place over lettuce or salad greens. 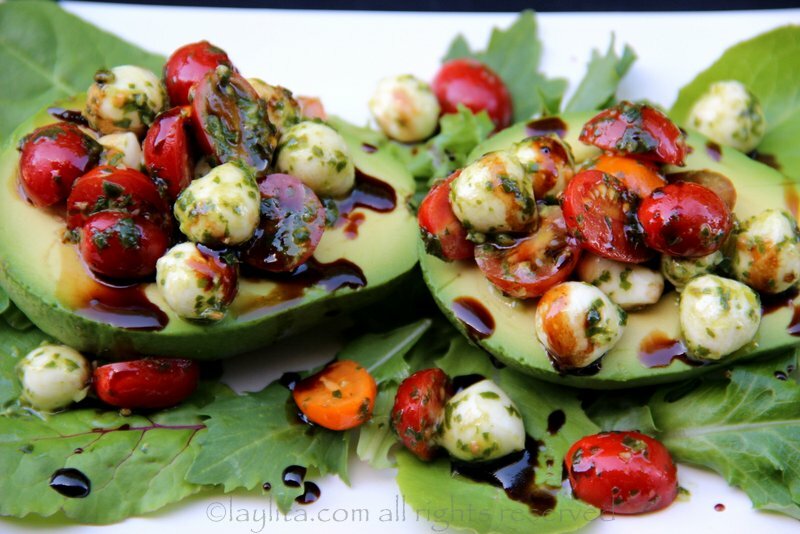 Spoon the tomato mozzarella caprese filling into the avocado halves. 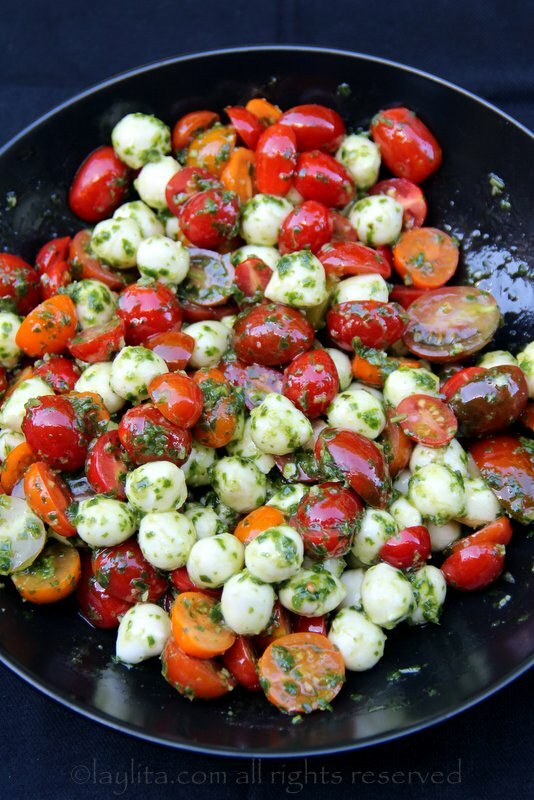 Drizzle with the balsamic vinegar reduction and serve immediately. 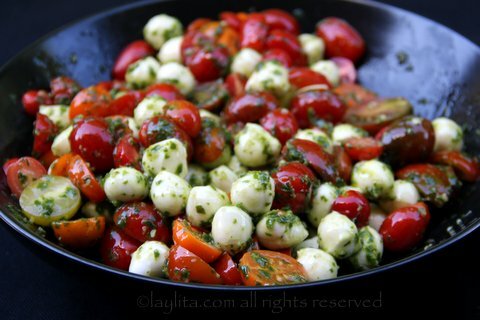 The tomato caprese filling, made with cherry tomatoes and mozzarella pearls, can be made ahead of time and refrigerated until ready to assemble the avocados. Just give it a stir before using it. The avocados should be cut and peeled right before preparing this dish. 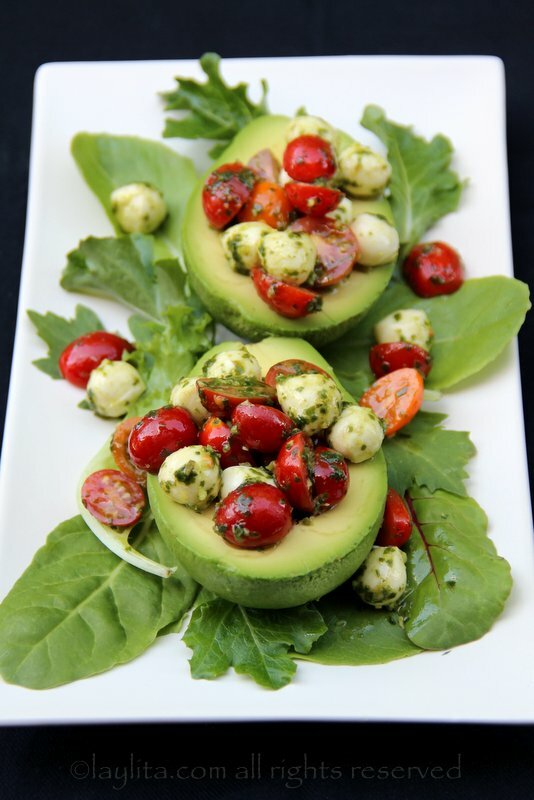 You can serve this caprese stuffed avocado over lettuce or salad greens; in fact it helps keep the avocado halves balanced if they have some greens underneath them. 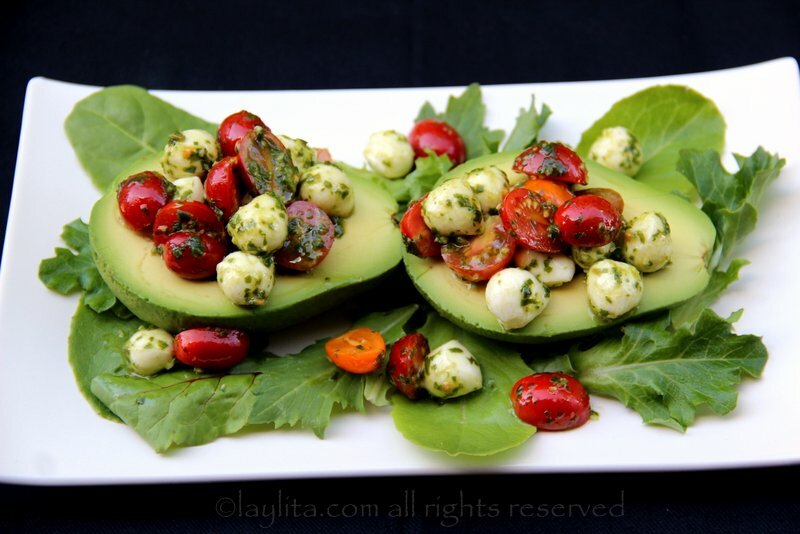 This can be served as main salad by serving 2 halves to each person, or as an appetizer or side dish by serving one stuffed avocado to each person. What a great presentation for such a tasty appetizer or side! Creative and delicious! Made this with dinner last night! Loved it! Great idea!!! I’m seriously craving this now! Looks SO yummy!! I agree with Yvette. 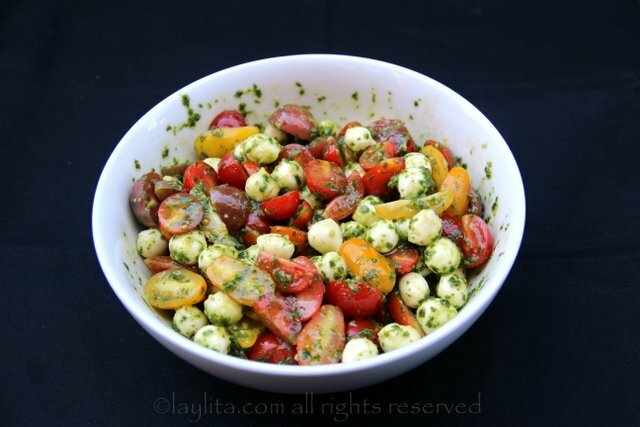 This salad not only is genius, but I usually have all the ingredients in my fridge. Are the “basil garlic oil sauce” and the “balsamic vinegar reduction” something you had to make or were you able to purchase those at the store? I made both at home, the basil garlic oil is just a mix of olive oil, garlic and fresh basil and is best made fresh at home. The balsamic reduction is simply cooking down regular balsamic vinegar, but you can probably buy it at the store. Looks delicious! 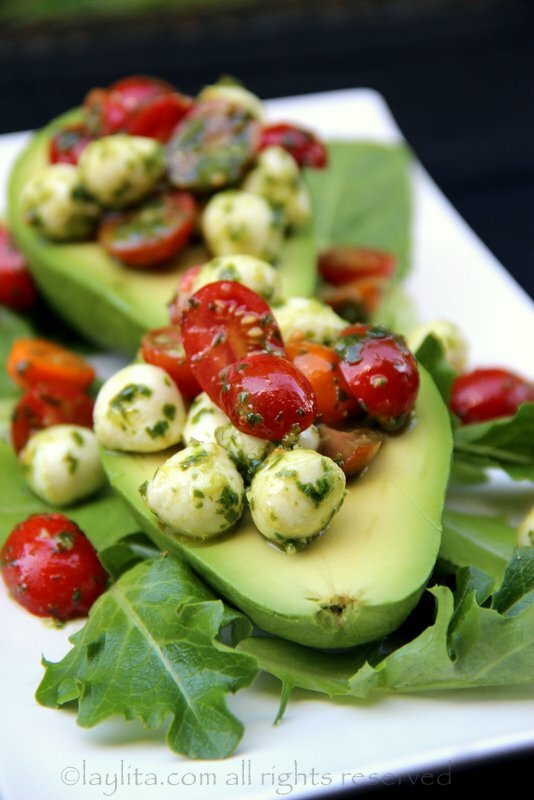 I usually add slices of avocados to my caprese salad, so this is genius. I love the idea of using the avocado as the vessel. Super great idea!